In martial arts, the phrase, "fan pu gui zhen" means: cut out (eliminate or remove) the flashy, showy movements and return to the direct, simple, and practical movements. Fate! Before one of my Taiji friends visited Hong Kong in 1997, he told me that he was going to meet a Yiquan/Taiji teacher, Master Chen Zhengzhong, whom he met some ten years ago. My friend told me that he has never met anyone like Master Chen... someone who can move my friend with ease "like his teacher". I was always interested in Yiquan and had read many books about Wang Xianzhai. I was fascinated by the Yiquan principles. In hope that one day I can meet Master Chen, I asked my friend to help me bring a bottle of cognac and a letter to Master Chen Zhengzhong to show my respects. A few weeks later, I asked another friend to help me bring some more wine to Master Chen. After meeting Master Chen, this friend told me, "Master Chen is very, very good. He threw me all over the place." I received a phone call from Master Chen a few days later thanking me for the gifts I sent him. It was astonishing how the martial arts conversation continued after the usual "How are you? I am fine stuff..."
I have spoken with Master Chen on and off for the last three years about Yiquan and Taiji. I've tried to sponsor him to the U.S. several times, but was never successful due to schedule conflicts. I continued sending more friends to him and continued receiving positive comments about him. My martial arts phone conversations and lessons with Master Chen continued. Although most of my friends have met him and told me how good he is, I never met him until last Summer (2000) when he and his cousin came by San Francisco on a tour. After three years of phone martial arts conversations, I finally met this Yiquan master face-to-face. When we first met, there was an odd and hesitant feeling. The frozen moment was broken once we shifted the subject to martial arts. Master Chen stayed with us for about a week. Let me tell you about this martial arts maniac - he talked and taught us Yiquan principles everywhere we went. On one occasion, when we were sightseeing in Napa Valley, we saw a statue with outstretched arms in the middle of the water fountain at one of the wineries. "We have a "pu shui zhong" in Yiquan. Imagine that you are standing in the water and you are actually scooping the water out of the ocean..." said Master Chen. On another occasion, in the middle of Muir Woods, surrounded by hundred feet tall redwoods, Master Chen demonstrated "testing the sound" of Yiquan. It was an awesome internal strength we felt coming out through the vibration of his "testing the sound". On another occasion, he attracted quite a crowd when he was telling and showing us his encounter with Ma Yuliang during his youth in Shanghai... This just goes on and on...our brains were overloaded. "Ask yourself why you do this posture?" "Where is the support point, and connections and what is the intention and result?" These are the questions he constantly asked and reinforced! Very scientific and practical! ? 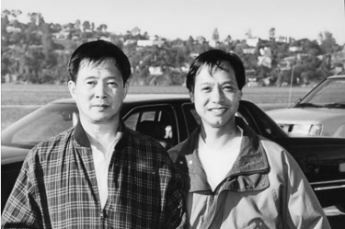 Master Chen opened the introductory page of Yiquan for me by leading my hands to feel his energy and the connections of each standing posture. Master Chen did Yiquan drills over and over, by putting principles and theories with applications and practice. Before we met, I normally call Master Chen about 12:00 midnight because of his schedule and the time zone difference between SF and Hong Kong. All those late night chats were worth it! I was able to bring him to one of my Taiji classes and persuaded him to hold a small "invitation only" workshop in the Bay Area during his last visit. The time was too short. We really didn't have enough time with him. It was just too soon for him to leave us. By the way, I found out Master Chen doesn't drink after all. :-) I hope Master Chen can return to the Bay Area soon. * Tony has visited Master Chen many times in HK since his first visit to Bay Area in year 2000. Master Chen came to Bay Area again in 2011, 11 years later after his first visit to the Bay Area! Again, we hope he will return sooner on his next visit!